Home Videos Rare Video Shows James Hetfield & Lars Ulrich Engage In Epic Drum Battle – This Is So Cool! If you’ve ever been to a Metallica concert, than you’d know just how superb those live shows are. Metallica really do pull out all of the stops at their live shows. Whether it’s pyro, drum battles (as you’ll see), or simply their superb instrumentation, The band’s live shows are a can’t-miss event when it rolls via your town. Their live shows are a number of the greatest pure and simple. 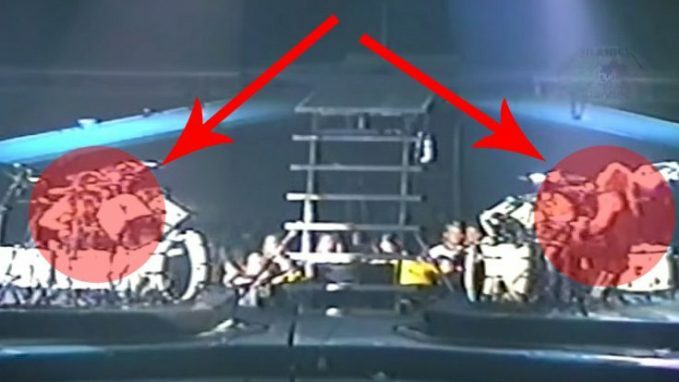 Back in the late 80s/early 90s, Metallica would dedicate a good portion of their live show to a hilariously epic drum battle between drummer Lars Ulrich and frontman James Hetfield. If you were lucky enough to see one of these drum battles live, then you’d know that this was definitely probably the greatest things about the show. Here’s the proof! What you are about to watch is a rare piece of footage that has a clip of one of these epic drum battles live in Jackson, MS. Unfortunately, Metallica does not do these drum battles live anymore, nut we can still relive the epic drum battles they’ve had right here! See for yourself!